Alex Waibel is a Professor of Computer Science at Carnegie Mellon University, Pittsburgh and at the Karlsruhe Institute of Technology (KIT) ( Germany). 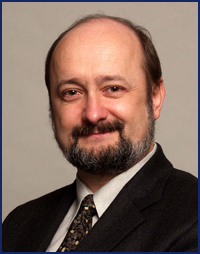 He is the director of the International Center for Advanced Communication Technologies (interACT). The Center works in a network with eight of the world's top research institutions. The Center's mission is to develop multimodal and multilingual human communication technologies based on advanced machine learning algorithms to improve human-human and human-machine communication. Prof. Waibel and his team developed many statistical and neural network learning algorithms that made a number of communication breakthroughs possible. These included early multimodal interfaces, first neural network speech and language processing systems, the first speech translation systems in Europe and USA (1990/1991), the world's first simultaneous lecture translation system (2005), and Jibbigo, the world's first commercial speech translator on a phone (2009). Dr. Waibel founded and served as chairmen of C-STAR, the Consortium for Speech Translation Advanced Research in 1991. Since then he directed many research programs in speech, translation, multimodal interfaces and machine learning in the US, Europe and Asia. He served as director of EU-Bridge (2012-2015), CHIL (2004-2007), two large scale European multi-site Integrated Project initiatives on intelligent assistants and speech translation services. He also served as co-director of IMMI, a joint venture between KIT, CNRS and RWTH. Dr. Waibel is an IEEE Fellow and received many awards for pioneering work on multilingual and multimodal speech communication and translation. He published extensively (>700 publications, >23,000 citations, h-index 79) in the field and received/filed numerous patents.